Human Capital Intelligence through data analytics holds the potential to transform recruiting as we know it. In fact, I founded Intellerati determined to harness the power of computer-assisted research for competitive advantage. I had seen what analytics could achieve in my previous career as an award-winning investigative journalist. My analytics ah-hah moment came when I learned about the work of investigative reporter Bill Dedman in an investigation published by The Atlanta Journal and Constitution entitled “The Color of Money”. Dedman’s reporting was so ground-breaking, it received journalism’s highest honor, the Pulitzer Prize.The thing that amazed me then — and still blows my mind — is that Dedman figured out a way to prove what had never been proven before. 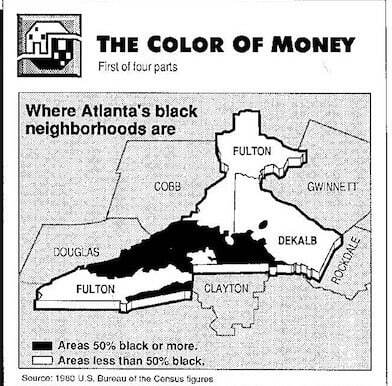 Before that series, reporters could never prove that lending institutions in Atlanta were racially discriminating against prospective borrowers. Lenders would refuse to lend money or extend credit to borrowers in an illegal practice known as redlining as if they’d drawn a red line around areas more populated by minorities. People living inside the red-lined areas would be denied credit or charged exorbitant interest rates. Before Dedman’s investigative series, all one could do was offer up anecdotal evidence, such as interviews with African Americans with excellent credit and high income, who were inexplicably denied a loan. Watchdogs would even send in financially identical test couples to apply for a mortgage, one of the couples was white, the other a couple of color. Inevitably, the caucasian couple would emerge with a decent mortgage, while the non-white couple would be denied a loan. However, whenever watchdogs confronted the lender with the anecdotal evidence, the banks would insist they were equal opportunity lenders and that a rogue lending officer was to blame. Time and again, the lenders would wiggle out of accountability for discriminatory lending practices. That was until “The Color of Money”. Ask Who Has the Data and Go Get It. The banks and savings and loans institutions were required to report the location of each loan they issued by census tract under the federal Home Mortgage Disclosure Act. So Bill used the federal Freedom of Information Act to obtain the lenders’ reports on computer tape from the Federal Financial Institutions Examination Council, a federal agency. He then matched the lending data with demographic data from the U.S. census and with more current information from the Atlanta Regional Commission. By mashing thee data sets together, he caught the redlining lenders red-handed. Bill proved blacks are rejected more than twice as often as whites when they apply for home loans at America’s savings and loans, according to government records of $1 trillion in loan applications analyzed by The Atlanta Journal-Constitution. Yep, that’s $1 trillion with a “t”. From where we sit, research — real research — is not a name, or a Google search term, or a LinkedIn connection. It not a job board, or a tracking system, or a database full of resumes. Rather, research is the process by which we harness the power of data. It requires data analytics expertise and some pretty advanced critical thinking to transform random bits of data into actionable intelligence. Yet the investment is worth it. It is how we deliver candidates that clients never dreamed existed — candidates other search firms missed. But human capital intelligence, informed by analytics, holds the power to do so much more. It can inform the investments of private equity, venture capital, and corporate merger & acquisition teams, transactions typically worth ten, if not hundreds, of millions of dollars. So, the next time your organization focuses obsessively on cost-per-hire to define your ROI and raison d’être, remember that human capital intelligence done well can result in far more lucrative dividends.